This week’s double whammy review hails from innovative Aussie publishers, The Five Mile Press and addresses two common childhood dilemmas; refusing to go to bed and stuff that scares you. When I see the names Danny Katz and Mitch Vane together, my mouth twitches involuntarily into a smile. 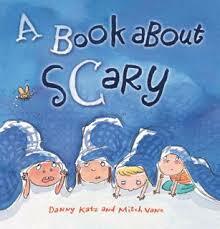 But this is A Book about Scary. So should I be feeling fearful instead of funny? 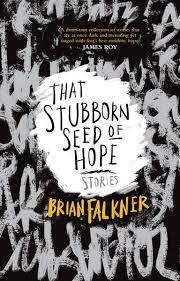 The premise is delightfully simple; everyone is scared of something. So what’s your biggest fear? Katz artfully leads us through a tidy alphabetical listing of some of the more common childhood terrors; clowns, dogs, needles as well as some not so common; quacking ducks! (Actually my toddler was terrified of the quacking toilet duck ads for years). And Katz hits the nail on the head every time. How many of us have had to resort to sugar-coated food bribes to tempt a trembling toddler onto the escalator? And why does the monster in the plughole that drinks up kids’ bath water have to sound so scary? 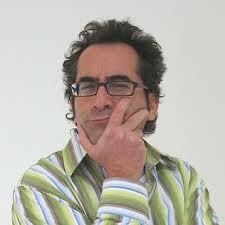 Katz tackles these curly questions with style and wit using the exact tone and voice any five year old would when faced with validating their fears. When a scary situation requires a little more explanation, Katz luxuriates in two to three pages of it, often concluding in a concise and comical one-liner; ‘clowns are pretty funny’ and ‘yummm’ – poor devoured moth. Mitch Vane’s self-confessed ‘wonky and messy’ illustrations add a fabulous sense of playfulness and just enough silliness to reassure young readers that fear is really just a state of mind. I could hardly believe we’d covered twenty-six fears so fast. Luckily the end pages reconfirm it is ok to be frightened of something every so often, just as Katz and Vane are, and feature even more scary stuff. There’s even a generous space left for readers to draw what scares them most. Brilliant! But my 7 year old already beat me to that one. Even if you already know your ABCs and have conquered most of your fears, A Book about Scary, will have 2 – 5 year olds trembling with laughter and agreement, and you smiling with quiet appreciation. 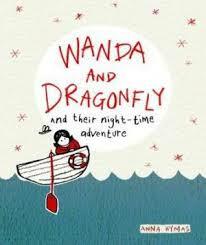 Anna Hymas’s, Wanda and Dragonfly and their night-time adventure, explores the nocturnal world of Wanda and her favourite toy, Dragon, who is really a dragonfly. Wanda thinks the world is far too exciting to waste on sleep and she’s right. When counting sheep fails, Wanda and brave Dragon forsake slumber and decide to take a night-time rocket flight around the universe. They stop by the moon, shoot past stars and after burning their thumbs near the sun, return to Earth to discover yet more strange and wonderful lands. Deeply satisfied with her expedition, Wanda is not surprised to wake from a sound night’s sleep and discover a new friend in her bed secreted from ‘the land of others’. This is a whimsical little tale richly illustrated yet with an economical and subdued palette that will encourage children with aversions to going to bed that sleep can be as wondrous as wakefulness. Good to read with 3 – 5 year olds. The Five Mile Press – Both picture books available now.